I recently heard about the new film, Connected, out in theaters this week. Recognizing that I am tethered to my computer, iphone, email, and other technologies more and more with every passing week, I can't wait to see the film. As I read the excerpt below, what interested me was her question, "Can we find great value especially for women with this interdependence of technology?" And also, the unanswered question is, "How do we turn off technology and be allowed to live under the sun and with people?" Have you ever faked a restroom trip to check your email? Slept with your laptop? Or become so overwhelmed that you just unplugged from it all? In this funny, eye-opening, and inspiring film, director Tiffany Shlain takes audiences on an exhilarating rollercoaster ride to discover what it means to be connected in the 21st century. 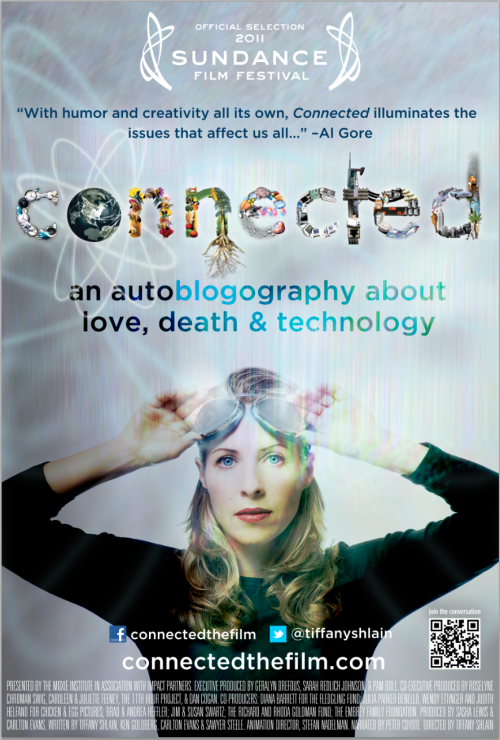 From founding The Webby Awards to being a passionate advocate for The National Day of Unplugging, Shlain’s love/hate relationship with technology serves as the springboard for a thrilling exploration of modern life…and our interconnected future. Equal parts documentary and memoir, the film unfolds during a year in which technology and science literally become a matter of life and death for the director. As Shlain’s father battles brain cancer and she confronts a high-risk pregnancy, her very understanding of connection is challenged. Using a brilliant mix of animation, archival footage, and home movies, Shlain reveals the surprising ties that link us not only to the people we love but also to the world at large. A personal film with universal relevance,Connected explores how, after centuries of declaring our independence, it may be time for us to declare our interdependence instead.